I love making easy and delicious cookies to feed a crowd, like Flourless Peanut Butter Cookies, Blueberry Lemon Ricotta Cookies and White Chocolate Lemon Raspberry Cookies. 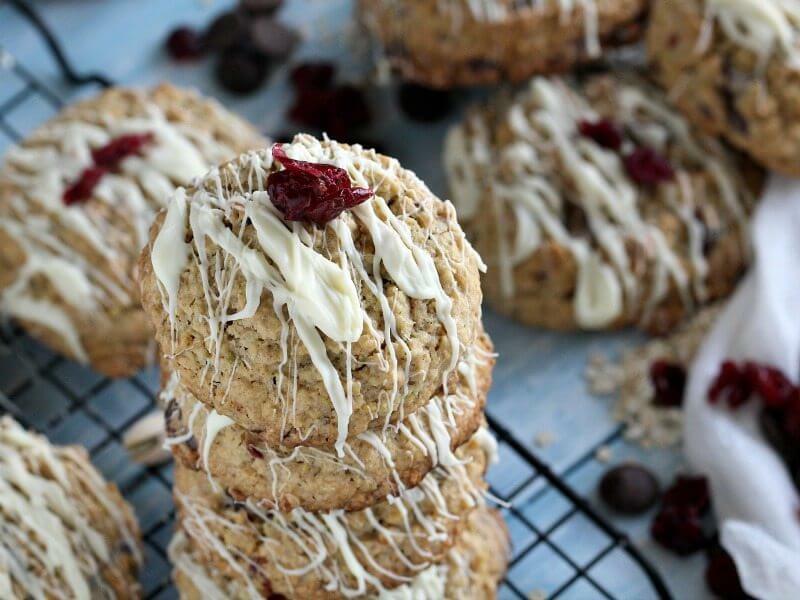 Cranberry Pistachio Oatmeal Cookies are the perfect way to start a crisp fall morning. 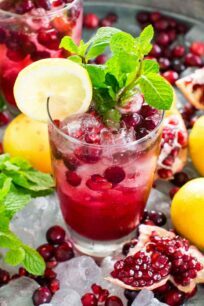 During this time of the year, I am ready to add cranberries to anything and everything! 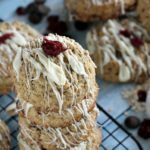 These Cranberry Oatmeal Cookies have an amazing texture, with chewy, dense and rich cranberry and pistachio flavor. They are pretty to look at, very tasty, and are the perfect seasonal cookies. Nothing like having a combination of chewy and crunchy all in one bite! 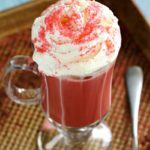 As mix ins I used colorful and tart cranberries, because they balance the sweetness of the chocolate nicely. Also, I like the pop of color they add to the cookies. Chopped pistachios are added into the mix, which also perfectly pairs the oatmeal with cranberries. To make them even better, I drizzled the tops with melted white chocolate. 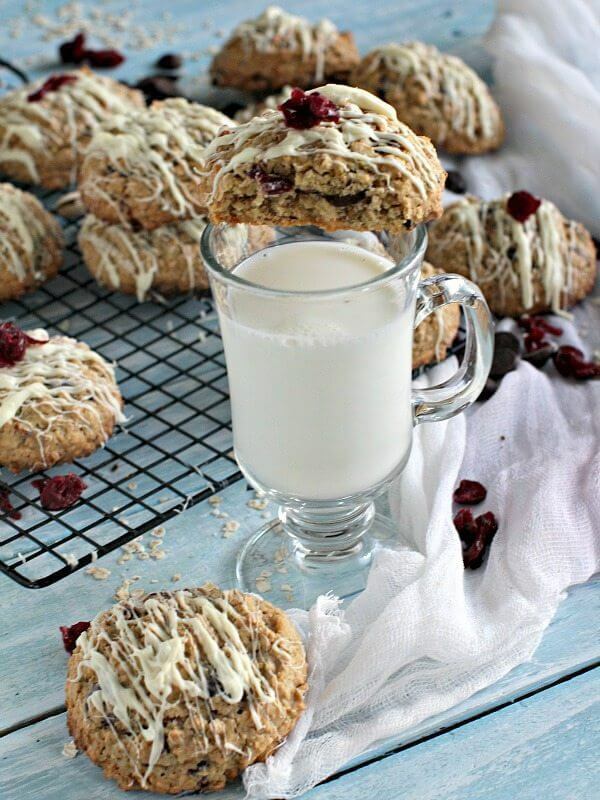 I recommend having these Cranberry Oatmeal Cookies with a glass of milk or chocolate milk. They also go well with coffee or tea. Make sure you don’t over bake them, because they will not be as chewy. Hence, start checking at the 20 minutes mark. Use larger chocolate chips, because they don’t fully melt when baked and are amazing when you bite into them! 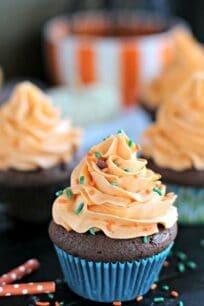 You can control the sweetness level by using semi sweet or bittersweet chocolate chips in this recipe. Add Orange zest or lemon zest if you prefer to have a more citrusy flavor. First of all they are rich and chocolaty, making them a show stopper dessert. Cranberry, pistachio and chocolate are just perfect together. How long will Cranberry Pistachio Oatmeal Cookies stay fresh? Can you store and freeze Cranberry Pistachio Oatmeal Cookies? Absolutely! Cool the Cranberry Oatmeal Cookies completely and fully wrap it in plastic wrap, tightly. After that wrap in aluminum foil. Freeze for up to 2-3 months. Defrost before serving. Adjust the oven racks to the low and middle positions as you will use two trays to bake the cookies. Line 2 large baking sheets with parchment paper and set aside. In the bowl of an electric mixer fitted with the wire attachment (or in a large bowl, using a hand mixer) beat the butter on medium speed until creamy. Add the white and brown sugar and beat until fluffy, about 2-3 minutes. Beat in the eggs, 1 at a time. Using a spatula or a wooden spoon, manually stir in the dry ingredients into the butter-sugar mixture. Once combined, mix in the oats, cranberries and pistachios. Using an ice cream scoop, scoop dough balls onto the parchment paper covered baking sheets. If you don't have an ice cream scoop, take 2 tablespoons of dough per cookie and roll the dough into a ball. Place the balls 2 inches apart from each other. Bake until the cookie edges turn slightly golden brown, 22 to 25 minutes. Mid baking, rotate the baking sheets and also move the top one to the bottom and the bottom one to the top to ensure uniform baking. Remove from oven and let the cookies cool on the baking sheets for 5 minutes before transferring to a cooling wire rack. Bring a medium saucepan half filled with water to a boil. Place white chocolate in a medium bowl set over the saucepan of simmering water, let it melt, stirring just a few times. Make sure the bowl doesn't touch the boiling water, to avoid overheating. Remove bowl from heat and using a fork drizzle the white chocolate over the cookies. These cookies are just gorgeous, Katalina! I love the cranberry and pistachio combo. And the glaze makes the perfect touch! These cookies look fantastic! Your photos are always so pretty! Cranberry and pistachio is a wonderful combination. Chewy and dense….definitely my kind of oatmeal cookies! Those white chocolate drizzles are totally irresistible. I am totally fine with long titles (obviously since you have been to my site)… I love a name that says it all! You could have just titled these cookies as delicious though! 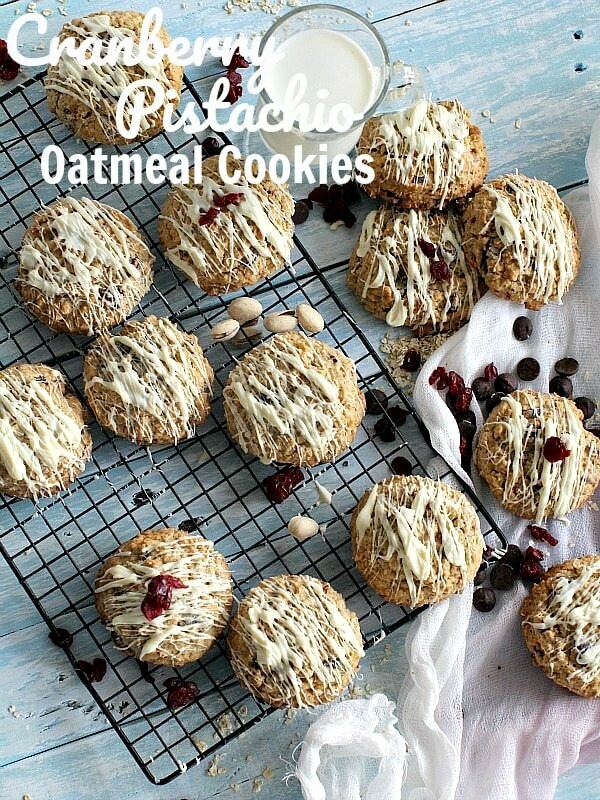 I adore a good oatmeal cookie, but these are taken up a notch! LOVE the cranberry and pistachio addition! SO YUM! Cheers, doll! Girl, if you left me alone with these they would be all gone too! So many awesome flavors going on in here! Love the pistachios! hah thanks Rachelle, you are right, they didn’t last too much in our house either! That first photo!!!! Just amazing!!! It is front cover of a magazine good!